Disney Parks and Resorts finally announced the future of Disney’s Hollywood Studios this weekend at the D23 Expo in Anaheim. One of the biggest reveals features some of Pixar’s smallest characters: Toy Story Land is coming to Hollywood Studios. Imagineer Kathy Mangum said that Disney’s goal with Toy Story Land is to match the awe-inspiring level of immersion that they achieved with Cars Land in California Adventure. Mangum shared a story of a child visiting Cars Land after it first opened and asking if that’s “where they filmed the movie?” If you’ve never been to Cars Land, it definitely holds a high bar for detail and immersion for US Disney Theme Parks. 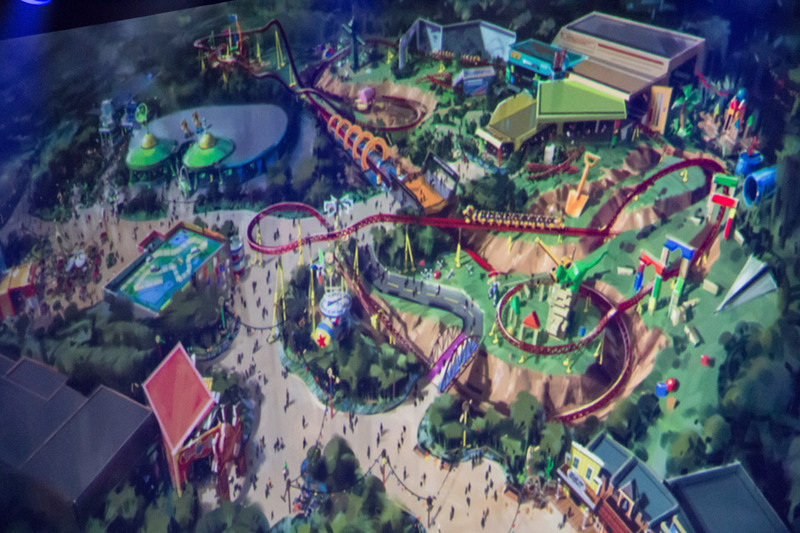 The long-rumored land will feature two new rides aimed at the whole family: a little green aliens saucer ride and a family coaster featuring Slinky Dog. 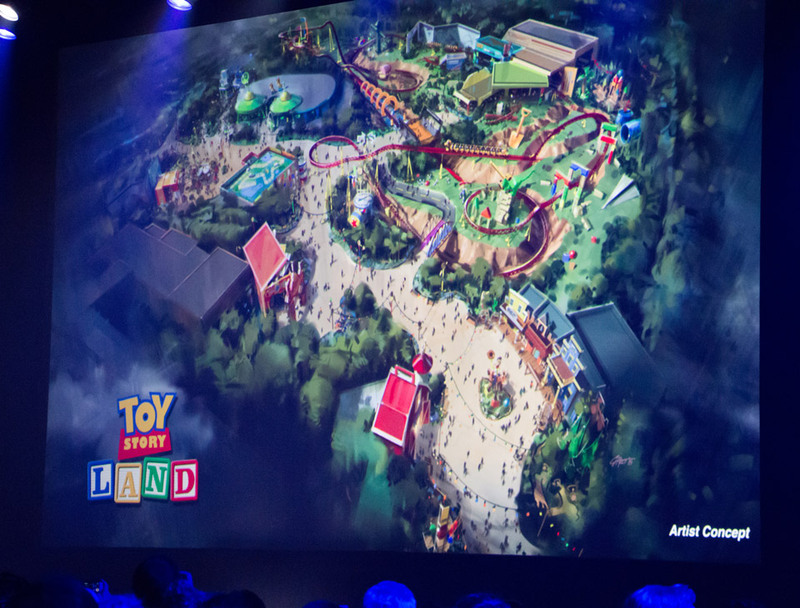 Fears that this would be just a clone of the Toy Story Playlands in Paris and Hong Kong were assuaged when Mangum shared that the two rides are completely original for Hollywood Studios. While Toy Story Midway Mania takes place under Andy’s bed (which was news to me), Toy Story Land takes place in Andy’s backyard. 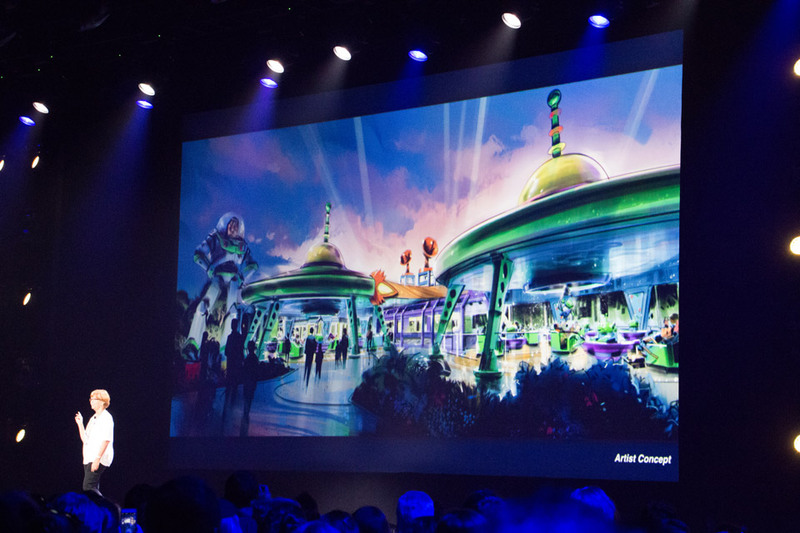 The saucer attraction will feature the iconic little green aliens from Toy Story and the dreaded claw. Not much else has been revealed, but speculation online that this ride system might be similar to Mater’s Junkyard Jamboree would sense. That would also be welcome for many guests who find a something like the Mad Tea Party too nauseating. The Slinky Dog coaster was described as a “family coaster,” which Disney has used to categorize Seven Dwarfs Mine Train. 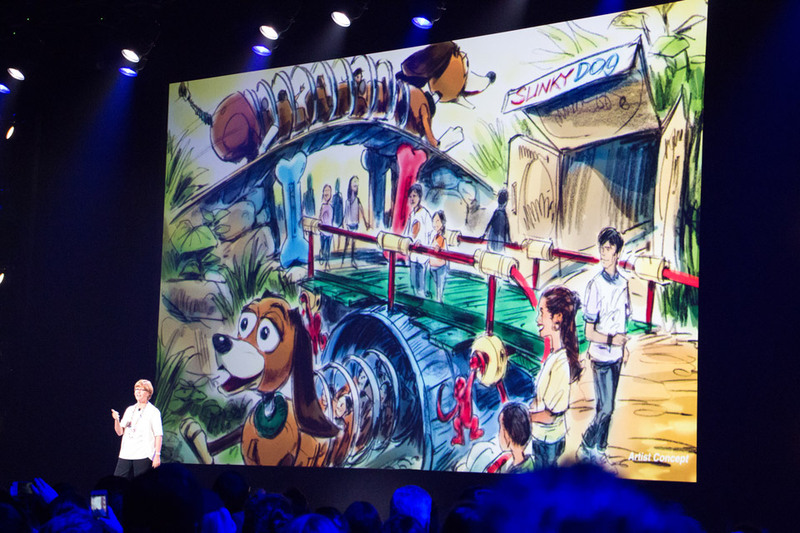 Judging from the CGI animation of the ride, the Slinky Dog coaster might even feature the same type of ride vehicle, as the cars seemed to sway left and right as they made their way through the tracks. The conceit for the ride is that Andy used a toy roller coaster kit to make the track but decided to combine it with his other toys in some unique ways. While this isn’t quite as gigantic news as some other announcements this weekend, this is great news for Hollywood Studios. That park is in desperate need of new attractions, and especially kid friendly attractions. While it seems like this fills a similar need as something like Toy Story Playland in Paris or A Bug’s Land in California Adventure, it seems to be a bit plussed in scope. A lot of questions remain: When will this open? Where will this go in the park? Will there be any new food locations? Why isn’t it Bonnie’s backyard? We’ll stay tuned for more details on Toy Story Land at Walt Disney World. Be sure to let me know what you think about Toy Story Land in the comments below.